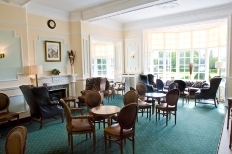 The present day Lounge Bar was the Drawing Room, from which steps led outside to the lawns. The presents Club’s reception/office was known as the Business Room (situated near the entrance so that any ‘strictly business contacts’ did not intrude into the social and family parts of the house). The Sports Bar was the Morning Room which led into the Dining Room. Behind a serving hatch was the quarters on the top floor. Upstairs, where the Belmont Suite is now situated, were eight bedrooms and a bathroom. The very top floor consisted of six bedrooms for the large domestic staff necessary to run the house. 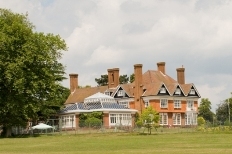 In 1938 Chigwell Hall was purchased by the Receiver of the Metropolitan Police to form No. 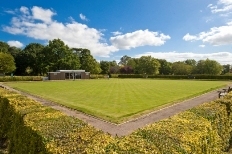 3 District Sports Club. The original contents were auctioned off by the Met., leaving only a grand piano and a grandfather clock. The clock still resides in the main lobby of the Club House, bolted securely to the wall. In 1973, the existing sports changing rooms were completed, just prior to the sad and fiery demise of the Belmont Hall. In January 1975 two Squash Courts were opened and in April 1984, after further enlargement, the Banqueting Suite was re-opened with due ceremony and celebration. In May 1984 Chigwell Hall was listed as a Grade II building of special architectural or historic interest in the Epping Forest District, effectively making any plans for exterior development very difficult. In 1988 the first floor, which in its time had accommodated bedrooms and a bathroom for the Savill and Waugh families, was extensively redeveloped and re-named the Belmont Suite to commemorate the fine mansion the once dominated the grounds before Chigwell Hall was built.